We created our first VS mode on the OUYA version of Amazing Frog? back in 2013, shared screen VS mode was really fashionable at the time and it was one of the strongest elements that OUYA had to offer,almost reviving the flavour of n64 shared screen gaming that played a large part, at least, in my gaming background. We wanted to be part of that, but what we couldn’t admit to ourselves at the time was that Amazing Frog? Universe was just not ready. We simply had not developed as much of the game as we had needed to at that point, to have branched out into “modes”. Other totally awesome VS mode games of the platform like Duck Game and Towerfall were built for the purpose of VS, but deep down Hal and I knew that until we made more progress with Swindon Shire and made the rag doll system less glitchy and more determined, we would not truly be ready for either a decent VS mode or good online play. 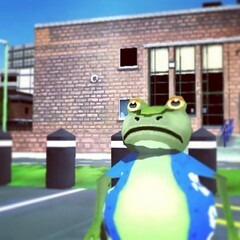 Over a year on from that point and after a year on Steam Early Access we have come a long way with Amazing Frog? And its really starting to feel like we are getting there. This is us playing Amazing Frog ( the current version f0.2.7) as though it was a VS mode, we need to understand how its going to be. For us is not just about Death Matches ( I mean it has a lot to do with it) but also racing, survival, fighting and sports (eventually) and a whole lot more as there are so many things you can already do in Amazing Frog? we just don’t yet have the modes to set up the scenarios.